It is with enormous pleasure that I welcome the first ever guest blog post on DigitalShakespeares. Over the past summer, Mary Odbert, one of our wonderfully talented MA students at the Shakespeare Institute, has been acting as a research assistant on this project, and she very graciously agreed to write up some of her final thoughts on the work she’s been doing. As you’ll see, much of this has involved watching and studying a selection of Shakespeare broadcasts, so, without any further ado, here’s Mary! Shakespeare’s presence in the digital world has opened up innumerable new modes of thought in both creative practice and criticism. In the process, a fledgling art form has emerged somewhere between the stage and the cinema in the form of the live theatre broadcast. It has been my pleasure this summer to work with Dr. Sullivan on her exploration of this new medium. To me, the most fascinating aspect of the live theatre broadcast is the means by which the camera affects the broadcast spectator’s experience of the theatrical production. The camera’s control over our perspective may be written off as an understood necessity in the context of film. Its angles, distances, and movements are accepted as part of the calculated art of filmmaking and the spectator experiences the film through the lens for better or worse. However, in the case of a theatrical broadcast film, this trust in the camera is somewhat ruptured by the film viewer’s awareness of the in-theatre audience. While, on the one hand, in-theatre audiences are restricted to a single perspective by their physical stasis, they are nonetheless in control of their more specific focus. Although unable to cut to close-ups on facial expressions or wide birds-eye-view shots for dramatic effect, the in-theatre audience controls where they look and when. The spectator’s bodily autonomy may be obviously self-evident to anyone who has ever turned their head to look at something, but it’s a luxury which registers as taken for granted when the camera operator makes a choice you wouldn’t have done. The Globe On Screen and The RSC Live use a fascinating array of camera techniques from self-contained framing to a complete avowal of the theatrical space, all to varying effect, but all nonetheless representative of specific stylistic choices. 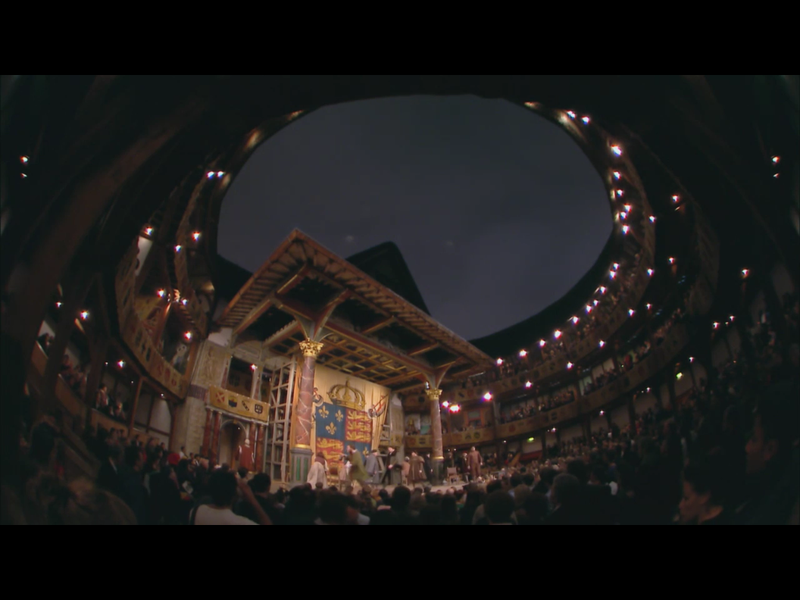 As a space wherein the theatre itself is as much a part of the experience as the production on its stage, The Globe On Screen tends more toward wide shots which include the building and the in-theatre audience. This choice is also partly driven by necessity simply due to the practical layout of the building. Apart from a straight shot from the front and center of the yard, there is essentially no angle which doesn’t inevitably include audience members in the background. As a result, the films maintain a diegetic distance from the plays themselves, always reminding the viewer of the constructed nature of the drama. This result is by no means a reflection on any inability of the actors to engage the spectator into their world. In fact, this is often successfully the case for the standing spectators in the yard sharing the space of the characters. But by including the in-theatre spectators’ experience in the film, Globe On Screen adds a layer of non-diegetic reality between the diegetic scene on stage and the engagement of cinema spectators. Rather than watching the play itself, Globe On Screen viewers watch The Globe put on a play. In its own almost voyeuristic mode, The Globe On Screen film puts its viewers in a position of watching an audience watch a play. The RSC generally takes a more cinematically-minded approach in their broadcasts. With more lighting technology and elaborate sets, the Royal Shakespeare Theatre has more tools with which to explore their own style of mise-en-scene in the filming process. Their films feature camera work which does more to exclude the audience from the frame, therefore keeping the diegetic engagement less disrupted for the broadcast spectators. High angled shots swooping down into powerful close ups enhance the impact of emotional moments. While the camera still enacts a certain authority over the film viewer’s point of view, moments like this exemplify the ways in which the camera provides perspectives otherwise impossible to the in-theatre audience. In some ways, the divide in new opportunities for experimental effects between The Globe and its indoor counterpart is one which echoes back to the days of the Blackfriars Theatre in the early modern period. To a certain degree, it almost feels as though The Globe’s focus on original practices perhaps hinders its development in the filmic realm. Then again, to read The Globe’s approach more as a documentary of the theatrical experience rather than embracing the temptation to see it as a film adaptation of the play recasts the work as a success within its own multi-generic classification. Meanwhile, The RSC continues to experiment and discover as much with their live broadcast techniques as they do with their stage adaptations. After analyzing this series of films, most from The Globe and The RSC along with several from The National Theatre for good measure, it seems clear that the entire notion of the digital broadcast of the stage production still has a great deal of development to come. This is not to suggest the films thus far haven’t been excellent, because they absolutely are! But it seems that the theatres are now reaching major turning point wherein the film is evolving beyond its point-and-shoot origins to embrace the artistry available to the cinematic mode. Rather than capturing the action on stage at its bare minimum with a static camera at the back of the audience, the filmed stage production is roaring to life as its own unique art form. The best parts of the shared theatrical experience, teleporting spectators from around the world into London’s Wooden O or the pride of Stratford’s riverside, blended together with the best of the cinema’s compositional techniques to create an unmatchable Shakespearean experience. 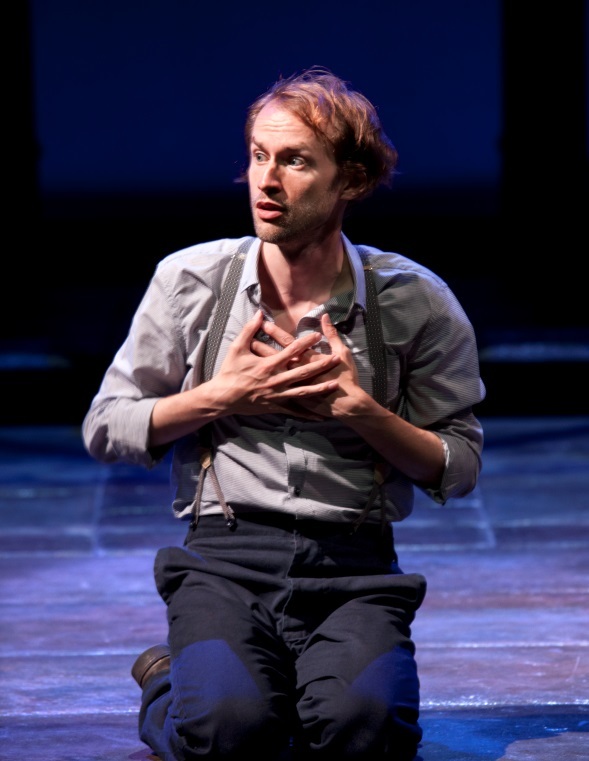 Guest post by Mary Odbert, MA Shakespeare Studies (Shakespeare Institute). So far my reflections on filmed theatre in this blog have concerned themselves centrally with live cinema broadcasts – but looking around online, in iMDB, in iTunes, and the like it’s very clear that many other forms of theatre-as-film exist for the viewing these days. One major player is Digital Theatre, a London media company that since 2009 has offered high quality, high definition recordings of major theatre, ballet, and opera productions for purchase and download. 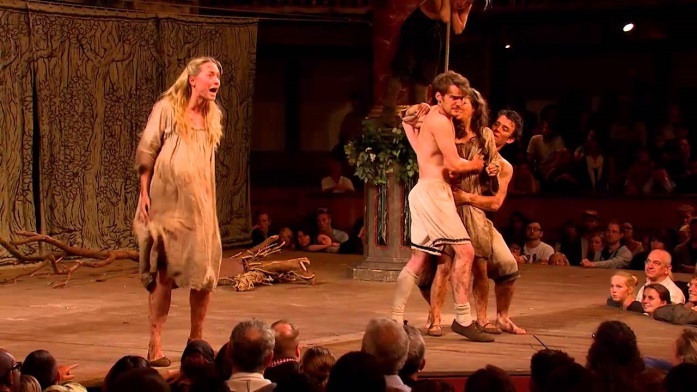 Amidst Digital Theatre’s current offering are about a dozen Shakespeare productions, including work from the Royal Shakespeare Company, the Liverpool Everyman, the Almeida, and most significantly Shakespeare’s Globe. I’ve been thinking a lot about Shakespeare’s Henry IV plays recently, not least because the RSC has just begun an 8-month run of its newest productions of them, so I thought it would be interesting to go back in time, as it were, and have a look at the Globe’s very well regarded productions of these plays from 2010. I never saw them live myself – 2010 was the year of finishing my PhD, finding a job, getting married – but several of my friends and colleagues did and they’ve become a frequent reference point for talking about the ways the Henry IV plays draw the audience into their world, most centrally through the character of Falstaff (played here by the wonderfully mischievous Roger Allam). So, the question is, how did this work on film? Very well, I’d say. As with NTLive and RSC live, multiple cameras are used throughout (I counted six cameramen in the final credits, and that seems about right in terms of variety of angles offered in the films), but the work these cameras did seemed noticeably different to me. First and foremost, the shots are fairly fixed, occasionally tracking with an actor but avoiding the sweeps and pans that characterize (or at least punctuate) the broadcasts I’ve seen of late. Although I don’t know for sure, I suspect this is partly due to technical set-up. Images of the audience are a frequent, and VERY WELCOME fixture in these films, with fringes of the groundlings almost constantly in view when we’re not in close-up (in fact many shots are framed in a way that looks like they are coming from a groundling spectator). Longer shots from what looks like the top gallery and (less frequently) the back of the pit show not only the full stage but also a very large proportion of the house and the audience that fills it, and it struck me that I never spotted a camera within these shots (although I must admit I wasn’t looking too hard). If audience space was blocked off to accommodate technical equipment, this must have been in the seated sections of the theatre and kept to a minimum, meaning I would suppose that the equipment was rather different than that used in the NT and RSC gigs. I certainly didn’t see any evidence of a camera crane in the house itself or in the kinds of shots offered in the films, and in this case I felt that the final product was the better for it. That’s not to say that cranes and the shots they produce don’t have a place in theatre broadcasting, but rather that great things can be done without them – and perhaps especially in a theatrical space like the Globe. The Henry IV films certainly use mid-shots and close-ups, but only after setting the scene with wider shots of not just the stage but also the whole house. And in distinction I think to the RSC Richard II, which similarly attended to this kind of theatrical framing at the start and end of scenes, the Globe films returned frequently to wider pictures within the scenes themselves. As I’ve already mentioned, these shots were relatively stationary, occasionally panning a little bit with a particular character, with wider shots being used instead for group scenes so that the characters in them walked through the picture, rather than the picture moving with them. More filmic techniques were limited to gradual zooms on a particular character while he gave a speech – I started to notice this especially towards the end of Part 2, for instance during Falstaff’s ode to sack after his scene with Prince John, which went from a full-length shot of Allam onstage to a head and shoulders shot that allowed us closer access to Allam’s surprisingly tender delivery of the line, ‘If I had a thousand sons…’ We saw this technique soon again when the King received the ‘happy news’ of the supressed rebellion, quickly overshadowed by the pains of his rapidly failing health, as well as during the mournful lines Hal speaks by his father’s deathbed. Very occasionally we also encountered more overtly self-conscious camera and editorial work, including the use of a divided, triptych-like screen at the start of each film, which offered sidelong views of the house to the left and right and scenes of the show to come in the centre. And at the end of Hal’s ‘I know you all’ speech in 1.2 of Part 1, the camera view receded to a wide-angled, upward shot of the Globe’s wooden ‘O’, offering a striking visual evocation of the experience of being in this atmospheric, open air space on a London summer night. But for the most part these moments that drew attention to the film as film were very few, and while I liked the more filmic touches I also appreciated the quiet, understated manner in which the productions were shot. They certainly backed off in the way I found myself wishing for in the Donmar Coriolanus, and the constant inclusion of the audience helped establish for me not only a feeling of the ‘theatrical’ as I watched these productions four years later from my iPad at home, but also added considerably to my experience of the individual performances, which were frequently audience-oriented — and nowhere more so than in the case of Allam’s Falstaff. These were without a doubt his shows. While Jamie Parker did an excellent job of bringing to life a winsome, loveable, if unconfident and eager-to-please Hal, Allam commanded not only the stage but also the whole theatre with his vivacious, incorrigible chancer of a Falstaff. Like many of the Globe productions I’ve seen, these Henry IVs frequently, sometimes strenuously played Shakespeare’s lines for laughs, even within potentially serious or more poignant scenes such as Hotspur’s first encounter with Henry IV in Part 1 or Shallow’s reflections in the orchard in Part 2. But the ribaldry started to disappear towards the end of Part 2, with Allam’s Falstaff letting slip the odd glance of regret as the fun of Eastcheap, and of youth, began to fade from view. Things had changed, not only because Harry was spending more time in the court and less in the tavern, but much more importantly because time changes us all, whether we like it or not. 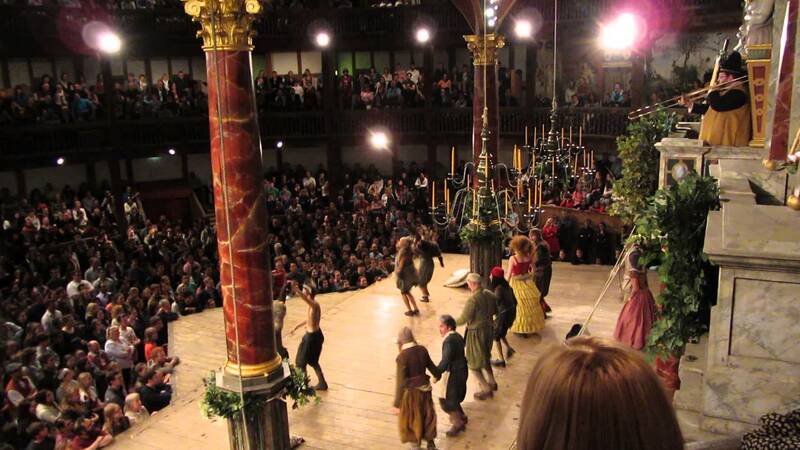 That said, to be able to look back in time in my own way to these productions at the Globe was certainly a treat. 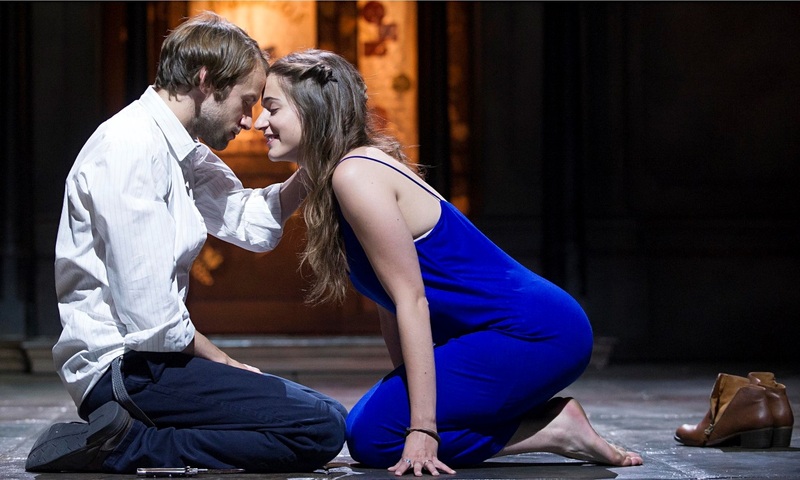 I’ll be thinking of them when I go to see the RSC’s Henrys this summer in the theatre and the cinema. The plays themselves offer an interesting take on what it means to be caught in two worlds, to be in time and out of time — something that increasingly interests me in terms of the digital. And while both sets of productions have been firmly period in terms of setting and costume, I think they have something important to say to us now about how identity is shaped by the ways in which we mediate between self and society everyday.